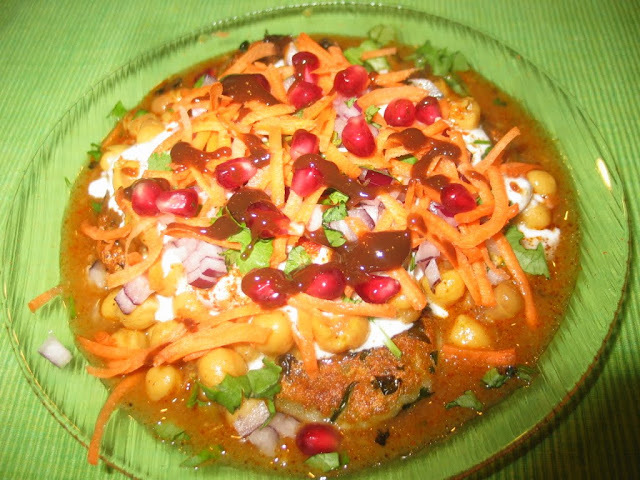 Chole Aloo Tikki Chaat is a very popular street food . Here the name chaat itself will make every Indian drool. I too love preparing and eating chaats. Whenever i have leftover Chole(Chickpea Curry) i usually make some aloo tikki and then a quick chaat. Eating tikki with chole makes it feel more healthy and i feel less guilty of eating all that potato.Top it with some fresh vegetables and curd and all the guilt vanishes immediately. 1. Mix mashed potato,green chilli,corriander leaves and salt to taste. 2. Take 2 tbsp of mixture in hand and form patties. 3. Shallow fry the patties on both sides to golden brown. 1. Mix curd, sugar, salt, water(optional),chilli pw,cumin pw. 2. Place 4 hot patties in a plate and cover it with the warm chole. 3. Add some curd mixture over it. 4. Sprikle few tbsp onion,carrot,coriander leaves over it. 5. Top it with some sweet tamarind chutney and serve. Wow I can have this at anytime of the day ..looks yumm and tempting. Such a yummy food nisha!! !